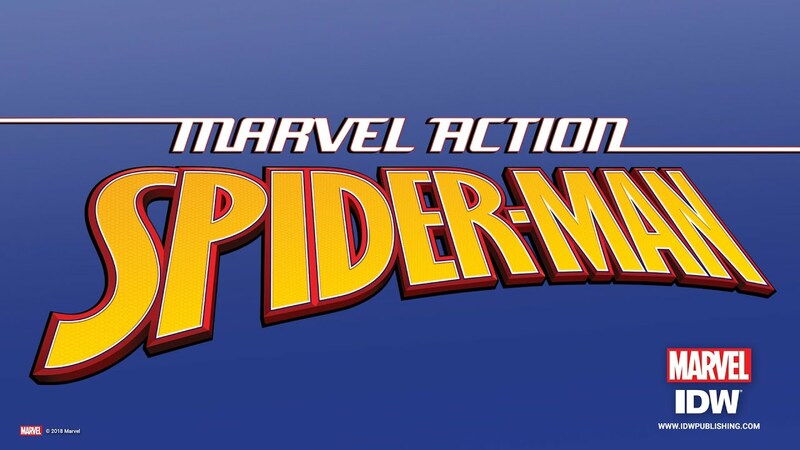 Home » Review: Is Marvel Action Spider-Man #1 the Future of Periodical Comics? What’s the future of comics? Periodical comics I mean. There’s been a lot of ongoing discussions, even here at The Beat by people more connected to the retail side of things about how we’re close to seeing a transitional shift in how comics are sold. I can’t claim to know what the future will look like, but Marvel Action Spider-Man #1 is as close as I could come to see what those transitional shifts will look like. I brought my son to one of the better comic shop in the city, for him, maybe for me too. He’s gotten a Lego Spider-Man set at Christmas and he’s been obsessed with Spider-Man since. We got him a spider-man pyjamas, the cool Miles Morales one, for his bed time. I brought him to the store and allowed him to pick the comic he wanted. He grabbed the new Amazing Spider Man issue #2 ,but eventually settled on Marvel Action Spider-Man #1, it’s got all of the cool Spider-People on it. Peter Parker, Miles Morales and Gwen Stacy. In Marvel Action Spider-Man #1, a teenage Peter Parker, already established has everyone’s friendly neighborhood Spider-Man is doing an internship program at the Daily Bugle and have a chance to interview billionaire industrialist and superhero Tony Stark (A.K.A Iron Man). He wants to ask him tons of questions about being a superhero. He meets Gwen Stacy and Miles Morales, who are also part of the same program. Their meeting is interrupted by weird mutant dogs that Peter goes to stop as his alter-ego Spider-Man, only to find his two new friends may be more than meet the eyes. It’s a perfect introduction to the world of Spider-Man. It’s fast-paced, action-packed, colourful, fun and engaging. There’s a real energy to the illustrations, It’s really kinetic, there’s a sense of flexibility, almost elasticity in the characters, particularly the Spider-people, movement is their thing after all and the artist Fico Ossio and colorist Ronda Pattison captures this really well. Delilah S. Dawson, the writer of this comic captures the way teens talk and manages to distill the essence of Peter Parker really well into this first issue. He’s a kid who’s constantly overwhelmed with life. He’s trying to help people as Spider-Man and it constantly interfere with his daily life. He’s got too much on his plate. He’s got an internship he wants to succeed at, he’s got a weird mutant rat problem he wants to solve, he’s got other Spider-people he’ll need to engage with. The comic lays out a mystery that I’d want to see more of. The creative team make you care about the characters and makes you want to see more of them. That’s a quite a feat in superhero comics.This was a good Spider-Man comics. It established a good tone and made me want to see more of this series. I was also happy to see problems solved creatively rather than with punching, it was fun seeing Spider-Man use his special powers in inventive ways. This got me thinking about the future of periodical comics. This is a comic book specifically aimed at kids, as a Spider-Man comic should be, but it’s not a Marvel comics. IDW is publishing this comic, not Marvel. Marvel is licensing some of it’s characters intellectual property to IDW to make specifically “kids comics”. Heidi MacDonald, our editor in chief, talked about this back in July 2017 when the news broke that Marvel made a deal with IDW (you can read it here). I’m wondering whether this might be the future of periodical publishing. It seemed like every year, periodical comics sales are diminishing, even as sales of graphic novels (or collected editions of periodical comics) increases. As Brian Hibbs, Brandon Schatz and Danica Leblanc and others have mentioned, the old ways of the comics business are struggling, with 2019 a potential make-or-break year for many retailers, and this new initiative might be a way forward. Narrowing the comics field with a larger demographic in mind. Spider-Man is for kids, the Spider-Man comics should be accessible to all. Marvel Comics has built something invaluable, a stable of characters that people know and love, but perhaps their view of periodical comics is outdated and broken. They seem to be getting by with an endles stream of crossover and special variant covers to keep themselves afloat, but this has a breaking point. Marvel could, theoretically, keep shepherding their IP’s into more valuable work. Outsourcing their IP to a company that still wants to make periodical comics while managing the brand and IP across multiple platforms (video games, picture books, TV, Movies, clothes, happy meal toys, etc.) might be a way to move forward. Periodical comics, single issues, or floppies, whatever you want to call it are here to stay, and so is Marvel Comics, but maybe Marvel doesn’t have to publish them in the future. Marvel has already said they weren’t great at making kids comics and there’s a corporate need to ensure readership expands. There’s also a relatively untapped demographic that IDW knows well and that Marvel isn’t connecting with. This partnership is a good way to get comics into kids hands and supporting a new generation of readers. DC Comics has it’s 100-Page Giant initiatives, Marvel has the IDW partnership. I don’t know if that’s the future of comics. My son is too young to know, but he likes Spider-Man, and this is what he picked out of countless racks of competing comics and Spider-Man issues. Maybe it is though, time will tell. – how much creative control do you retain when you licence your characters? – doesn’t that put an end to innovation and creativity (e.g. new characters, less consensual themes, etc) This is basically what happened with Disney comics, it neutered them. With the exception of one year in the 1990’s, Disney comics have always been licensed. This article was failed to do what it claimed it was going to do, which was give a review. There’s a lot “I don’t know “and it’s very obvious the writer has NO market insight whatsoever but feels the need to point out his “son” likes “the cool Miles Morales pyjamas”–which suggests that there is something uncool about Peter. Spider-man has been neutered over the last 20 years because he is seen as unmarketable despite the movies. spider-man has to be more clumsy and awkward than he was as peter parker in high school. this series looks like it’s in that vein.Spider-man is more like a 10 year old Spider-boy. Only women provide him with teachable moments. If you think I’m just crazy see “Spider Zine”. I’ve seen Chip actually plagiarize part of Spider-Zine, particularly setting up spider-man with a date with a black woman. it’s also weird to see spider-man see so uncertain dealing with minor threat and use the word “um” like he’s a nervous middle school girl . but I guess maybe that’s the point. Good thoughts, Philippe. But I think that we all have a responsibility , especially this month, to ensure that we clearly delineate for readers (of a site like this) what is a “thought piece” and what is reported news. I worry that too many “is this the end of comics?” articles bruises, or have bruised, the industry. Likewise, people don’t delay buying an Apple product because they sdee that Apple shares have been falling for the past two months. Tf are you talking about Spider-Man has always been incredibly marketable even in the last 20 years why do you think he the one who always gets the most cartoons and games not to mention in 2014 he was the most profitable superhero on the planet. IDW’s entire Marvel Action line is months late at this point, so, no, it’s not the future of monthly comics. It’s Dead On Arrival. I bought the first two Avengers book from IDW. It is a lot of fun. Reminds me of the old days. I bought the Spider-Man book for my twin grand daughters and read it cover to cover for them and they didn’t budge. They loved the Spider Verse movie and this is a great introductory comic to younger fans. I wasn’t aware they late but they seem to be coming out on a regular basis now. Disney has a long history of licensing their characters to comics publishers. Titan already publishes fan magazines aimed at kids featuring Star Wars, Spider-Man, and Star Trek. Disney Italy has produced some of Marvel’s kids comics, most noticeably The Muppets. For a market similar to the U.S., look at Disney UK and what they offer. My question: where are the tie-in comics for Disney XD shows? Milo Murphy’s Law, Star Wars Resistance, Big Hero 6? The IP holder retains all creative control. How much control is exercised depends upon the owner. The biggest example is Uncle Scrooge McDuck. This character was created for the Disney comics published by Dell, by Carl Barks in 1947. Scrooge would not appear in animated form until 1967. Neutered? No…quite the opposite, both in comics and animation. In comics, both Don Rosa and William Van Horn (among many others) have created bookshelves of new material, many of it award-winning, and almost all of it produced for overseas licensees such as Egmont. In animation, the classic stories created by “the good duck artist” Carl Barks inspired the first “DuckTales” series, which introduced Webby Vanderquack and Launchpad McQuack (among others). Then, in the current series, they completely reworked those characters once again. Huey, Dewey, and Louie each have distinct personalities. Webby is a great role model! And then there’s Glomgold…. I won’t spoil his new origin, but it is a great rethinking! Bentina Beakley…more backstory with Scrooge! Della Duck, the long invisible mother of HDL is now one of the main storylines of the series, having gone on adventures with Scrooge and Donald before HDL hatched! I think it’s a smart move by Marvel to outsource a Kids comics line. Despite producing some great efforts themselves over the years (Thor: The Mighty Avenger springs to mind), they seem to struggle with ‘entry level/out of continuity’ publishing when produced (and compared) side-by-side with their MU titles. So this move does make a lot of sense. And as noted, DC is trying something similar with its 100-page Wallmart books. Its not quite the future for all comics publishing, but a step in the right direction for franchise publishers like the Big Two.